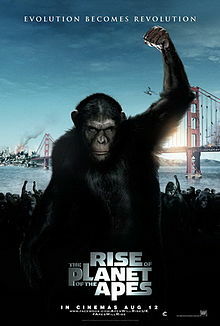 The thing that sets this apart is the realistic CGI effects that results in convincingly lifelike ape and chimps who take on human-like characteristics. In short order they become unhappy with their state in life and do something about it. That sets up lots of fast-paced action scenes culminating in one climatic battle that for some is a bit too long. Since the principal actors never get around to talking there won’t be any acting awards for them (nor for the rest of the crew either). A brief scene midway through the end-credits is probably a preview of the next instalment. You heard it here first. for violence, terror, some sexuality and brief strong language.